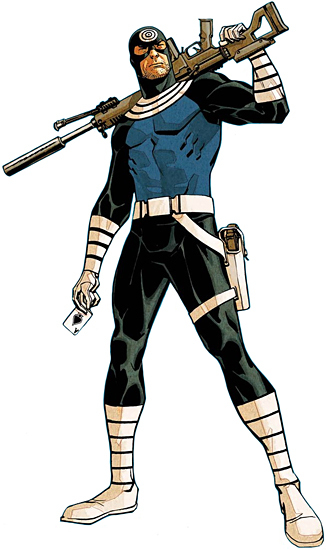 Creators: Marv Wolfman and John Romita, Sr.
Bullseye is an Olympic level athlete, a highly trained mercenary and an assassin. He is highly skilled in numerous martial arts forms and weaponry. He is an expert marksman and trained with explosives. Bullseye’s main talent is his ability to throw objects. He can throw almost anything and turn it into a deadly weapon. He has thrown pens, baseballs and hairbrushes all to deadly effect. Adamantium Skeleton: Bullseye’s Skeleton has been reinforced with Adamantium and as such his bones cannot be broken. Very little is known about Bullseye's past. He claims he grew-up in the Bronx and had a brother, along with an abusive father. The only time they shared as a family was shooting air rifles together. Even at a young age, he had excellent accuracy. This was demonstrated when he killed a pigeon by throwing a yo-yo. He and his brother attempted to kill his father at a young age by setting the apartment on fire. They were split up and both were placed in foster homes. While in high school he became a talented pitcher, and was offered a scholarship for college, but instead he opted for minor league baseball. According to Bullseye himself, he grew bored and annoyed pitching a no-hitter, so, for the last pitch of the game, he threw the ball at the batter, killing him. Bullseye found his true calling as a special operative of the United States National Security Agency and, from there, a freelance assassin, a perfect career for someone who got so much pleasure from killing his enemies. He created his signature modus operandi of using thrown weapons during one of his first outings as a soldier. A guerrilla fighter got the drop on him, and Bullseye’s weapon failed to shoot. He threw the gun instead, killing his assailant with his bayonet. Eventually he became a mercenary in Africa and spent his free time perfecting his throwing skills and mastering the unusual weapons he discovered in his travels. He returned to New York City where he adopted the costumed identity Bullseye.